Use these Christmas & holiday bags, gift wrap, tissue paper, boxes, bows & ribbon, and gift boxes for your retail packaging for customers, or sell them for your customers to use in their wrapping... or do both! 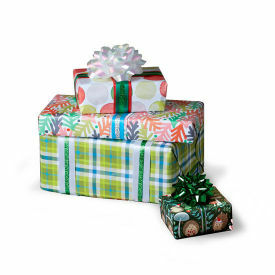 Christmas & Holiday Gift Boxes are a great option for E-Commerce businesses that ship a lot of goods at the holidays. You can also look at our themed holiday packaging or browse hundreds of custom printed tissue or giftwrap options. Spread the Christmas cheer this season by adding some extra flair to the items your customers purchase.